Due to some bugs and missing files we released the new testing version 0.3.10. A talk covering EPIC will be held at the German Perl Workshop 2005 (9th - 11th of February). The abstract can be found here. The talk and abstract are in german. The EPIC Project Team wishes all users and their families a Merry Christmas. To be more responsive in case of bugs or other problems (performance etc.) we decided to provide a Testing Update Site. This site will be updated if significant changes/enhancements were done to the EPIC plugin. The version provided by the Testing Update Site might contain bugs and is primarily meant for testing purposes. We try to keep the ChangeLog for the Testing Update Site up to date. If you encounter problems with the plugin try to install the version from the testing site, it might fix your problem. The new EPIC version supports Eclipse 3.0. The support for Eclipse 2.1.x is discontinued ! Among some new features like Regular Expression Breakpoint, TODO Markers and Explain Errors/Warnings the new version also includes the EPIC User's Guide. The User's Guide is available via the Eclipse help or as separate PDF file. The Colorer Plugin Extension is no longer supported. If somebody would like to continue the development of the Colorer Plugin Extension, please let us know. For more details please have a look at the ChangeLog. Due to the absence of the org.apache.xerces package (was available until M8) EPIC is currently not working with Eclipse 3.0 M9. So please use Eclipse 2.1.x for the time being. Several bugs have been fixed in the Editor/Debugger. The outline view is now able to handle POD comments correctly. Besides some small new features (run support for launch-configuration, support of command line parameters ...) the debugger now supports CGI debugging utilizing Brazil as integrated Web Server. The Update Site now supports any platform. A moderated mailing list for announcements concerning EPIC is now available. The new EPIC version now includes the first release of the Perl Debugger. We hope the debugger to be useful, although we are aware of the fact that a first release always includes a significant amount of bugs. Please provide Bug Reports in case you find bugs. The Eclipse Update Manager is now supported. The Perl Editor has been improved and some bugs have been fixed, please see the Change-Log for details. The Performance has been improved for the syntax check and the outline view. Instead of regularly checking the code every x seconds an idle timer has been introduced which only initiates a code check when the editor is idle for x milliseconds. Preferences have also been adjusted to reflect the change. In addition to performance improvements compatibility issues with Eclipse 3.0 M5 have been resolved. Users that use the Colorer Extension should have a look at the Notes for Eclipse 3.0. Shows already used variables and displays them. This might not be 100% accurate, but should make life easier. Can be switched off via preferences. Uses perltidy to export sources files to HTML. As for the source formatting feature a working Perl interpreter is required. NOTE: Please remove the old plugin before installing the new version. The patch is available from the download section. 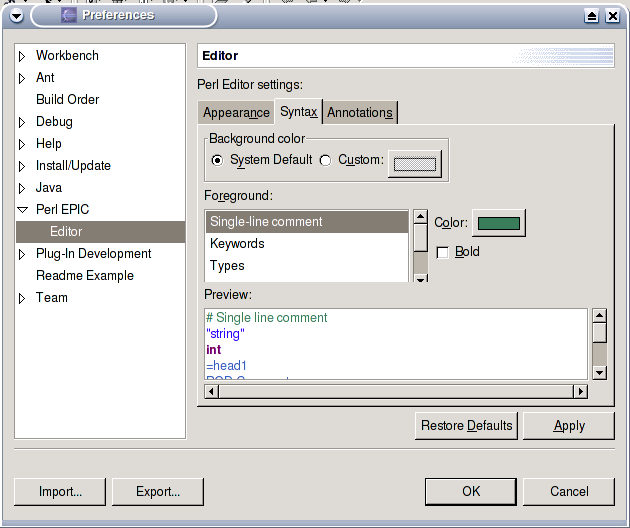 A eSpell add-on is provided to add spell checking support to the Perl Editor. The Perl extension can be downloaded from the download section. The Source Formatter was blocking on big files. That should be fixed with this version. No default templates are available for the time being. So it would be nice if users would send in their templates. PerlTidy is used for source formatting and is provided with the plugin. For a detailed list of changes please have a look at the release-notes. EPIC uses the Color Editor plugin for syntax colouring. This plugin does not work correctly with Eclipse 3.0. No colouring is done at all. Please use Eclipse 2.1 for the time being. Due to API changes in Eclipse 3.0 the last version of the Perl Editor Plugin did not work with Eclipse 3.0. The new Editor Plugin is a compatibility version which makes it possible to use the stable Eclipse 2.1 and on the other hand test Eclipse 3.0. In the new version basic Perldoc support has been added to the editor's popup menu. The Colorer Extension has also been updated to support Eclipse 3.0. For more details, please have a look at the ChangeLog. With the new version of the Perl Editor it is now possible to use spaces instead of tabs. The corresponding option has been added to the Editor Preference page. The Colorer extension has also been updated to support the new feature. CTRL-C, CTRL-V and CTRL-X support was added to the RegExp plugin. Christopher H. Laco (http://today.icantfocus.com/) has written a nice article about running Perl script within Eclipse by using "External Tools...". The article can be read here and will also be present in the FAQ section. The new version does not use temporary files any more to validate Perl syntax. Temporary files were used because syntax validation got stuck from time to time on Linux. As a workaround temporary files were used (but we were never happy with this situation). It turned out that this is a Linux/Solaris Java bug since version 1.4 (Java bug 4750978). Linux/Solaris users should use Java 1.3.x when running Eclipse. On request an extension to support the Colorer Plugin in EPIC is provided. The addon is unsupported and provided as is. The Color Editor Plugin is still the standard EPIC syntax highlighting engine. Color Editor is platform independent and integrates much better into Eclipse than the Colorer Plugin. Developers who would like to work on this extension are welcome. The sources were imported into CVS. EPIC now uses a slightly modified Color Editor plugin (http://gstaff.org/colorEditor/) for syntax colouring. The plugin is included in the PerlEditor package. Editor preferences have been extended and now cover Appearance, Syntax Highlighting and Annotations (screenshot). 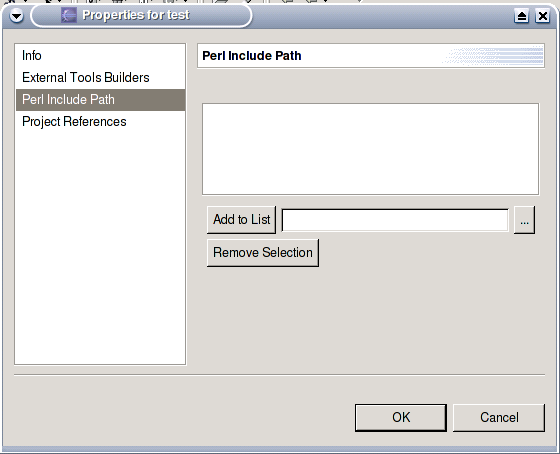 Include Path settings have been added to the Perl project properties (screenshot). The new Editor Plugin supports Eclipse 2.1 features (it is recommended to install Eclipse 2.1). A Perl perspective and Project Type are also available in the new release. There were a lot of questions concerning Content assist and installation, these are handled in the FAQ section. For more information have a look at the FAQ. When EPIC does on the fly syntax checking an external Perl task is executed. On some Windows versions a CMD Windows is opened and closed again. For a workaround have a look at the FAQ.